Illustrator Guy Francis (past blog post here) is the original creator of the Banjo Pigs, but many other people have taken a shot (not literally!) at them as well. Featured in the April exhibit was fellow illustrator Stacy Curtis, Guy's brother Jed Francis, Greg Newbold, Brian Kershisnik, Maryn Roos, Jim Madsen, and even J. Kirk Richards' son, Bryan, and daughter Maegan. The pig drawings actually began as a duel between Guy and Stacy, instigated by owning real banjos, and then, as the back and forth pigs piled up, Guy and Stacy decided to give them their own blog and let others join in! (I'm pretty sure that one of Guy's daughters is a mega awesome banjo player. Or maybe all of his kids are. They're all very talented.) Will Terry (Armadilly Chili, see post here) has done a few (Will even got one of his UVU classes in on the piggy action. Click Will's name here -the video is on the BP blog) as well as Nathan Hale (Rapunzel's Revenge), and even Tony DiTerlizzi (The Spiderwick Chronicles)! 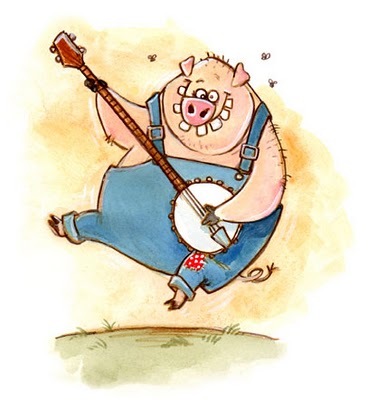 The Banjo Pigs blog, "The Dueling Banjo Pigs", is open to anyone, anywhere in the world, to send in their own unique pig-plus-banjo renditions. You should give it a shot! I should give it a shot! I think I will! And, Dude, there's even a Banjo Pigs store! Below are the photos from our April gallery visit. 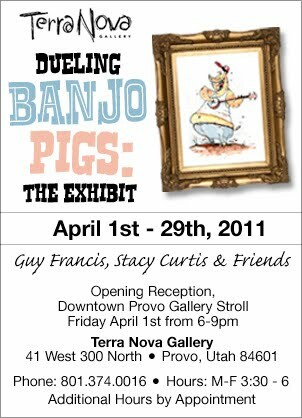 Be sure to go "The Dueling Banjo Pigs" Blog to see the real deals in their natural environment.